The new Ford Mustang Bullitt. 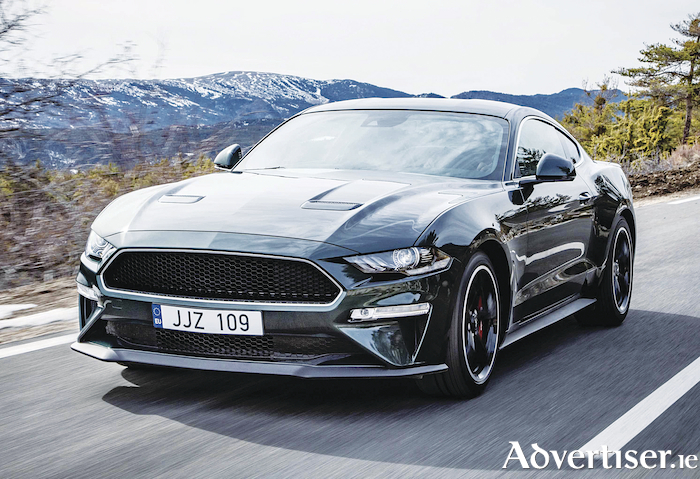 Ford has delivered European public debuts for the new Ford Mustang Bullitt which is set to go into production for customers in Europe from June. The brand also gave debuts to the new Edge sports utility vehicle, Ford’s most advanced SUV, and the new KA+ Active, the first SUV-inspired crossover version of Ford’s KA+ value-for-money car. Celebrating the 50th anniversary of the legendary Warner Bros film starring Steve McQueen, the new Mustang Bullitt special edition was unveiled with the support of third-generation members of the McQueen family, Chase and Madison McQueen. Mustang Bullitt features Ford’s 5.0-litre V8 engine enhanced to deliver an anticipated 464 PS and 529Nm of torque, introduces new rev-matching technology for seamless gear changes, and is offered with a choice of ‘Shadow Black’ or classic ‘Dark Highland Green’ exterior colours. “Our special edition new Ford Mustang Bullitt evokes a unique heritage we’re proud to share with the McQueen family, and are excited to offer for customers in Europe for the first time,” said Steven Armstrong, group vice president and president, Europe, Middle East & Africa, Ford Motor Company. The new Edge SUV is the company’s most technically advanced SUV, offering a comprehensive range of camera and sensor-based driver assistance technologies to make journeys more comfortable and less stressful, and to help drivers avoid or mitigate the effects of collisions. The new Edge also debuts in Europe a new powerful and fuel-efficient 238 PS bi-turbo variant of Ford’s 2.0-litre EcoBlue diesel engine, combined with a new eight-speed automatic transmission for effortless cruising. The new KA+ Active further enhances the new KA+ compact five-door model with rugged bodystyling, raised ride-height and unique chassis tuning, unique front grille design, exclusive interior finishes and a high-level standard equipment specification. Also on show in Geneva was Ford’s completely renewed, dynamic and stylish Tourneo people-mover line-up. The spacious new Tourneo Courier, Tourneo Connect and Tourneo Custom models offer enhanced style, sophisticated interior technologies and advanced powertrains to European customers.